Home Unlabelled Shocking Video: Woman Commits Suicide. Jumps Off Ten Storey Building! Shocking Video: Woman Commits Suicide. Jumps Off Ten Storey Building! 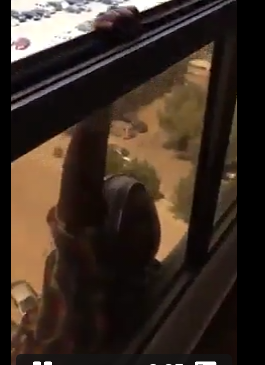 A SHOCKING video is making its way around the internet – it shows a woman FALLING OFF of a building in Saudi Arabia. The official explanation is that the woman – who is an African Migrant working as a maid – committed suicide. But listen to her screams. The women hanging on the window is a servant, and she is asking her employer which is from Arabian gulf. But the employer laughs it off lik eit’s a joke She is heard saying,” what are you doing you are crazy” with a laugh in her voice.